It’s that time of year again when nominees are set on edge, performers begin prepping the musical numbers, and the band gets ready to play you off at the thirty-second mark. Yes, friends, it’s Oscar season! And that means it’s time for me to keep with tradition and and give my picks for the awards – which have historically proven to be totally accurate*. First off, you should be reminded that the Academy changed up the format a bit this year, nominating ten movies for the Best Picture category – up from the more traditional five. They claimed this was so they could give movies that don’t traditionally make it into the category a fair shake – movies like “The Dark Knight” who were arguably snubbed in previous years because they weren’t dramas, which tend to dominate the category. They won’t win, mind you, but they can get nominated. Lets take a look at the nominee list. It’s a pretty impressive bunch this year, with a number of surprising movies getting nods in a number of categories. “Avatar” and “The Hurt Locker” both tied for most nominations – which should come as no surprise – with a total of 9 in a variety of categories. Nipping at their heels is overrated revenge fantasy “Inglorious Basterds” which everyone seems to like except me. “Precious: Based on the Novel ‘Push’ by Sapphire” and “Up in the Air” both got 6 nods, which is also no big surprise as both had a lot of Oscar buzz when they came out. That’s the top five in terms of sheer numbers, but I’m going to go one further due to surprise – Disney-Pixar’s “Up” got 5 nominations. And one of them is for Best freakin’ Picture. I half expected it, but seeing it happen is still a pleasant surprise. We’ll start with the crappy awards, and work our way up to the statues that actually matter. Or you can skip to the end to see a handy list of all the nominees along with my picks depicted in glorious Red Carpet Red. Starting things off at the bottom, achievement in art direction, achievement in cinematography and achievement in visual effects will all get snapped up by “Avatar” without much question. “King of the World” James Cameron had better hold those statues tight, though… it’s going to be a long night of disappointment for him. “Inglorious Basterds” will get a bone thrown their way in the technical mix as well, for achievement in film editing. Achievement in sound editing and achievement in sound mixing will both go to “Star Trek“. Yes, I just wrote that. 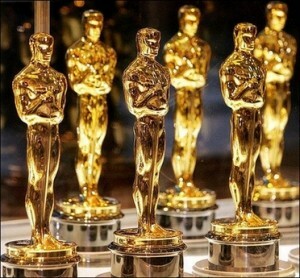 “Star Trek” will win a pair of Oscars – just one less than I predict “Avatar” will. Achievement in makeup goes to “The Young Victoria” because the Academy loves period pieces, which is why it’ll be unusual to see it get beaten to the podium by “The Imaginarium of Doctor Parnassus” for achievement in costume design. “Food, Inc.” will take best documentary feature, while “China’s Unnatural Disaster: The Tears of Sichuan Province” takes best documentary short subject. While we’re on the topic of movies no-one will ever see, best foreign language film of the year will go to French film “Un Prophete”. In the short film categories, best live action short film will be given to “The Door” and best animated short film goes to “Logorama”. Moving on to the more melodious categories, we see Disney all over the freakin’ place – as they always are. That said, Hans Zimmer will get the award for best original score with “Sherlock Holmes”. Disney needn’t worry, though, as Randy Newman will pick up the best original song award for “Down in New Orleans”, one of the two songs he was nominated for from “The Princess and the Frog”. In the writing mix, adapted screenplay will go to “Up in the Air”, while original screenplay will end up in the hands “The Hurt Locker”. Alright, we’ve gone through to the stuff people really care about. First of all, it’s the only nominee who’s also up for a best picture award, so is there really any doubt “Up” will take best animated feature film of the year? Going through the acting awards we’ll see Jeff Bridges and Sandra Bullock repeat their Golden Globes victories as best performance by an actor in a leading role and best performance by an actress in a leading role respectively. For those keeping track, that’s for “Crazy Heart” and “The Blind Side”. Best performance by an actor in a supporting role will go to Woody Harrelson for “The Messenger”. Best performance by an actress in a supporting role will end up in the hands of Maggie Gyllenhaal for “Crazy Heart”. Final two. Still with me? Hold onto your hat, James Cameron because achievement in directing will go to Kathryn Bigelow for “The Hurt Locker”, and where directing goes, so too does best motion picture of the year. Why? Because ultimately, “Avatar” is a science fiction movie. It never really stood a chance, now did it? Thanks for coming out, everyone, enjoy your statues and your after parties, and get back to making movies we love to watch. ← FML Friday: seriously, day, eff off!